Are You There Coco? It’s Me, Patty. 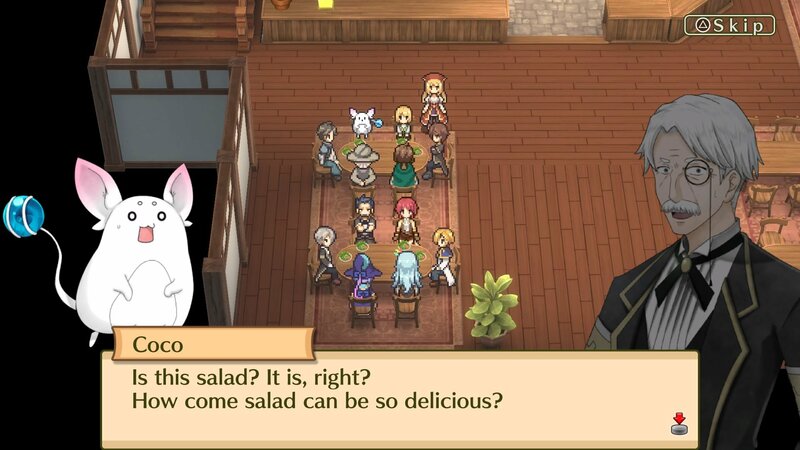 Developed by Rideon and published by Kemco, Marenian Tavern Story: Patty and the Hungry God is a game that reminded me how much fun crafting-based RPGs can be. It’s been a decade since I enjoyed Atelier Iris: Eternal Mana, but in that time I hadn’t dipped my proverbial toe back into the waters of this sub-genre of RPGs until Tavern Story showed up on the PS4. There’s a certain charm about a game entirely centered around the concept of cooking food, and with over six hundred possible recipes, there’s a lot of food to cook. For any turn-based battle system enthusiast, the combat alone holds its own and help make the entire game experience enjoyable. Marenian Tavern Story: Patty and the Hungry God begins innocuously enough: Patty and her brother Gino are returning home from a day trip when, with his attention on the book he’s reading, Gino walks right into a statue, knocking it over. This accident results in the freeing of Coco, the titular Hungry God, from his 100-year prison. As cute as the little bugger is, he’s also unfortunately the God of Poverty, which begins what one might call a series of unfortunate events that set the stage for the game. Patty’s father’s tavern, house, and villa are all seized by the bank for unpaid debts; her father takes off without a goodbye to raise money; and a shady-looking character, banker Gustav, kicks Patty, Gino, and Romano out of the house. As fate would have it, a nearby mayor is happy to have the daughter of a famous restaurateur take over the run-down local tavern and gives Patty a place to stay. A question every omnivore asks themselves at least once. To be clear, there is virtually no system in Tavern Story that doesn’t revolve around food, and the game is no worse for this. Game days in Tavern Story are broken into three basic parts: shopping in town for ingredients and cooking, going out into the world to explore a dungeon or another town for ingredients, and coming back to the tavern for any final cooking before opening for business to sell food for money to start the cycle anew. The dishes players cook are not just sold for in-game money, but are eaten by the characters for EXP, used to boost stats for a day, and fed to Coco to advance the story. Except for a few weapons, pieces of armor, and healing potions, it’s all about the food! Players will obtain hundreds of recipes by purchasing them at stores, talking to NPCs, stealing from enemies, viewing story events, and through blind trial and error. While experimentation is fun, caution must be heeded as failure comes at the cost of the ingredients used. Failure doesn’t need to happen often though as many recipes follow a set pattern that players can rapidly recognize to start making larger profits off more exotic dishes. A full quarter to third of game time will be spent in various menus dealing with ingredients and recipes, an enjoyable part of the gameplay that is quick to learn, surprisingly deep, and enjoyable to get lost in for long periods of time between adventuring. Adventuring for ingredients and battling enemies is where players will spend the rest of the non-cooking time in Tavern Story. Patty begins her adventuring by befriending the shopkeeper Erika and mayor’s son Dante to accompany her into the game’s dungeons to obtain ingredients for cooking. As the story advances, other players will join Patty, each with their own unique background and reason for staying to help satiate Coco and push the story forward. Before players head out each day into a dungeon, a team of three must be selected that cannot be changed until returning to town later that day. This is a bit of a missed opportunity in Tavern Story; players have access to a rather large pool of playable characters, but no way to switch them in battle or during a dungeon, so there’s little to no incentive not to simply create a party that works and stick with it throughout the game. Experience is only obtained through eating, so feeding three members and building them up while leaving the rest unused is a perfectly viable strategy as characters have access to a wide variety of battle skills, and at no point is a particular character or party build required to progress. 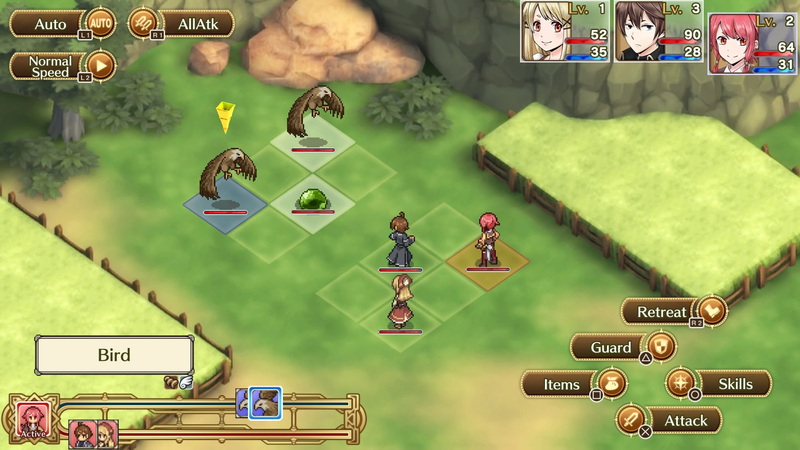 A typical battle in Tavern Story, turn-based with a small grid and action bar. Battles are classical turn-based affairs that allow players to attack, defend, and use an item or skill. Skills are plentiful and are obtained through elemental experience used in battle. Want to learn that ice-based attack a character will have access to? Fight a bunch of water-type monsters. Want that earthquake spell? Fight more trees, moles, or ground-types. Battles take place on a 2-by-3 grid battlefield with characters and enemies lined up in opposing formations. Front lines are susceptible to more attacks while back line characters need ranged weapons or spells to do decent damage. Spells and skills can splash across rows or pierce from line to line so a bit of strategy is required to place characters according to their strengths and weapon types. The system is a slightly above-average affair helped a bit by the action bar that shows players and enemy turn progression. Various attacks and spells can affect positions or the speed of the bar, delaying combatants’ actions or speeding them up. There are two types of auto-battle players can engage as well, one that just uses physical attacks and one that uses abilities and spells. Unfortunately, both should be avoided as the AI is extremely inconsistent and frequently will cast high-cost spells on nearly-dead enemies or on those that are immune to it, or attack the enemy with the highest HP instead of finishing off a weak one. While an easy-to-understand battle system may lull unsuspecting players into thinking the game is easy, difficulty spikes abound for the unprepared. Many times players will find themselves breezing through dungeons mopping the floor with randomly encountered trash mobs only to encounter a final stage boss they can barely put a dent in. Luckily the game is prepared to help players through such difficulty spikes as any party wipe offers three choices: quit, begin the battle again, or use a special currency, jewels, to revive everyone and continue the battle from that point. While beginning random encounters again is nice if players perish from poor battle planning, it’s the use of the jewels, a currency that feels left over from the game’s mobile gaming roots, that somewhat breaks the game. Given one hundred of these jewels at the beginning of the game and earning a couple every day during random battles, bosses can be vanquished by constantly hitting them with the highest-cost spells and skills, having a party wipe, and using a jewel to revive, recover, and continue. 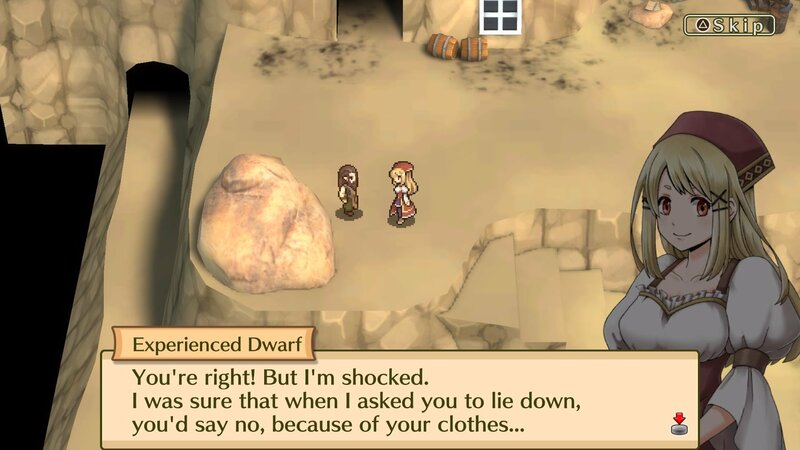 Regardless of your clothing situation, never trust an experienced dwarf that wants you to lie down. Tavern Story is visually very nice, though backgrounds and character portraits are obviously not straining the PS4 by any means as this is a port of a mobile title, but they look nice and are often bright and quite detailed. The characters and monsters are sprite-based, but other than noticing their pixelation compared to the rest of the graphics a few times, it’s not an issue as the sprites are animated fluidly. The two art styles work very well together. The music is also quite good in Tavern Story. While perhaps not many tunes will have players humming along with them, the urge to press mute isn’t felt very often either. The town songs are cheerful, the world map has a lively tune, and the battle theme appropriately conveys both danger and excitement at the same time. Marenian Tavern Story: Patty and the Hungry God is a spiritual successor to the developer’s previous Adventure Bar titles; while no previous knowledge of the series is required, it may motivate those who previously overlooked titles to give them a second look. While I’d not heard of the series before playing Tavern Story, my enjoyment of this game was such that I purchased Adventure Bar Story for 3DS immediately upon completion! While Tavern Story might never reach the level of fandom that the Atelier series enjoys, its entry into the crafting RPG sub-genre should not go unnoticed. Multiple options available when battles are lost instead of just a "game over"